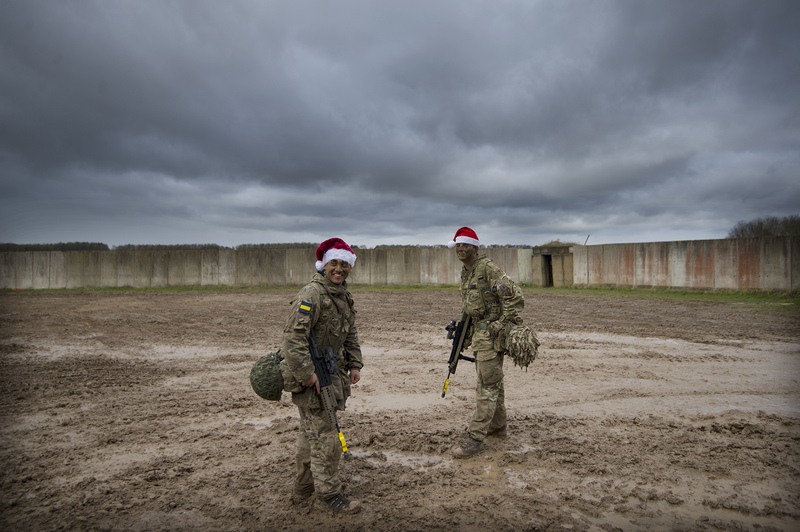 PIC: Private Piers Smedley (4th Battalion) and Lance Corporal Paul Brien (3rd Battalion) Princess of Wales’s Regiment. Army Reserve troops from the 3rd and the recently formed 4th Battalion, Princess of Wales’s Royal Regiment combined for their final training exercise of 2017 on Salisbury Plain. Their target was to seize the village of Copehill Down and their prize, a slap up four-course Christmas lunch served to them in field conditions by their officers. In time honoured British Army tradition a soldier’s Christmas dinner is the one time in the year they can relax and put their feet up as their officers serve them their festive fayre. So, having fought their way house to house and captured their objective of the village of Copehill Down – a purpose built military training complex that tests troops at fighting in an urban setting – 200 exhausted mud caked soldiers from the two Reserve battalions of the Princess of Wales’s Royal Regiment laid down their machine guns, grenades and bullets to be treated to an all-the-trimmings Christmas meal complete with crackers and silly hats! The 4th Battalion, Princess of Wales’s Royal Regiment is one of the newest Arrny Reserve infantry battalions having been formed earlier in the autumn of 2017. With its Headquarters in Crawley it has Company locations in: Portsmouth, Farnham and London.